Homburger was once the Zurich arm of Baker & McKenzie, breaking away to become an independent firm in 1991. The modern arbitration group emerged seven years later from a reorganisation overseen by former partner and now special counsel Markus Wirth, former president of the Swiss Arbitration Association, and Thomas Müller before he retired in 2014. Felix Dasser took over the leadership of the practice in 2010. The team includes Balz Gross (a prominent figure during the Megafon saga over ownership of a Russian telecoms company) and Gabrielle Nater-Bass, the president of the Arbitration Court of the Swiss Chambers’ Arbitration Institution (SCAI). Other partners to know include Mariella Orelli, Roman Richers and Claudio Bazzani. There is also senior counsel Georg Naegeli, a former partner at the firm who was once a state court judge, and counsel Kirstin Dodge who joined the firm in 2006 after having been a partner at the US firm Perkins Coie for several years. Though present only in Zurich, the team comprises lawyers from civil and common law backgrounds, including some US-qualified lawyers. Like many firms in Switzerland – a country that encompasses German, French and Italian culture, and recognises four national languages – it regards itself as especially prepared to argue cases in all Swiss national languages and, of course, in English, as well as offering a multicultural approach on cases. While the firm is unable to disclose many of its clients, it can tell us that it represents an “overwhelming majority” of the companies listed on the premium segment of the Swiss stock exchange. These include Swiss household names Kraft Foods, Nestlé, Novartis, Roche and Alpiq (formerly Altel), as well as international names such as Sony Ericsson, Vivendi, Sky, Andritz Oy, Generali, Takeda and Malaysian Airline System Berhad. In recent years, the firm has reported an increase in telecoms and pharmaceuticals clients. It has also acted for governments in the Middle East such as Jordan. One of the firm’s biggest recent successes was helping to defeat a US$1.6 billion claim brought against a Middle Eastern government and state-owned fund under a partnership agreement. The defence required an analysis of the past 30 years of the Arab-Israeli conflict, with 11 days of hearings and 40 witnesses presented. Mariella Orelli led the team. In 2015, a team headed by Balz Gross helped a Jordanian state-owned investment fund to defeat a US$130 million LCIA claim by a company owned by Qatari investor Ali Alyafei – persuading a sole arbitrator that a purported deal to acquire a stake in a bank relied on a forged signature. Homburger ensured that award was upheld in the Swiss courts in the following year, and helped Jordan secure the discontinuance of related ICSID and UNCITRAL claims worth US$500 million that Alyafei had brought under two obscure regional investment treaties. As part of a group of law firms, Homburger achieved remarkable results in the Megafon proceedings concerning ownership of a Russian telecoms company. The team turned the arbitration around by producing evidence of money laundering and corruption in Russia. It overturned an unfavourable award in what was the first successful revision of an award before the Swiss Federal Tribunal on such grounds, before winning the main dispute. Other highlights include Dasser’s negotiation of a US$156 million settlement for German technology firm Infineon in an IP arbitration with a Taiwanese company; and a win for Swiss power utility Alpiq against Italy’s Enel in a dispute over long-term electricity supply contracts. It has also helped Alpiq win €43 million in a VIAC claim against Polish energy group PGE. In a couple of ICC cases, Homburger says it succeeded in persuading the tribunal of misbehaviour by the opposing party. In one case, the client was the buyer in a major M&A transaction, who accused the seller of massaging financial results. In the other case, the firm helped a European state-owned company prevail in a misrepresentation claim against a US trading company. Last year, the firm had success in the Swiss courts defeating a challenge brought by two Egyptian state entities against a US$288 million ICC award in favour of East Mediterranean Gas. The award – which related to the termination of a deal to supply gas from Egypt to Israel – required the state entities to pay US$1.7 billion to an Israeli company, which retained different counsel. Swiss energy company filed for rectification proceedings a month later. Felix Dasser continues to act for Swiss real estate investor Pawlowski AG in an ICSID claim against the Czech Republic. Meanwhile, with regard to its commercial caseload, in what to is thought to be a “first”, a team led by Orelli succeeded in convincing an arbitral tribunal that a proposed addition to the counterparty's legal team would jeopardise the integrity of the arbitral process. Orelli, with a team led by Carlo Santoro of Cleary Gottlieb Steen & Hamilton, also had success when applying to the court of the Swiss Chambers’ arbitration institution to de-consolidate proceedings initiated under two agreements between the same parties relating to the same transaction and containing the same arbitration clause. The court agreed that separate tribunals should be constituted for hearing claims under each of the two instruments, including because different laws governed the instruments. As a result, one of the two proceedings was dropped. A team led by partners Balz Gross and Andri Hess successfully represented an international US/Swiss pharma company as claimant in a claim against a US company in connection with a patent dispute, with ancillary proceedings before state courts and patent offices. In addition, the firm says patent license and sport rights arbitrations and high-profile post-M&A disputes have kept the team very busy. Melissa Magliana, who was recently promoted to the partnership and in 2016 was the recipient of the Swiss Arbitration Association’s biennial prize for advocacy in international commercial arbitration, moved to Lalive in Zurich. A Swiss provider of technical services in the aviation sector had occasion to use Homburger for an ICC arbitration seated in London. The firm “performed very well”, was always on time and took care of the details, the client says. Georg Naegeli impressed with his detailed analysis of the case and his “immense experience”. Sean Sullivan, a partner at intellectual property law boutique Lee Sullivan Shea & Smith in Chicago, says he has worked with Homburger for the past 10 years, initially on the recommendation of one of his former clients, Roche. “Not only are they intelligent, professional and highly skilled as lawyers, but they have consistently been very easy to work with,” he says. Their advice is always “on point” and their interactions with arbitrators and opposing counsel are always “professional, courteous, credible and persuasive”. Felix Dasser is “calm, professional… and always takes the high road”, while Melissa Magliana is “an excellent advocate” and “a joy to work with”, he adds. Yossi Ashkenazi at Israeli law firm HFN has been using Homburger as co-counsel on a major Zurich-seated arbitration in the pharmaceuticals sector. He says the team are “clearly on the top of their game” and “outstandingly professional and highly communicative and responsive”. Gabrielle Nater-Bass and Balz Gross attract “huge appreciation” from clients. 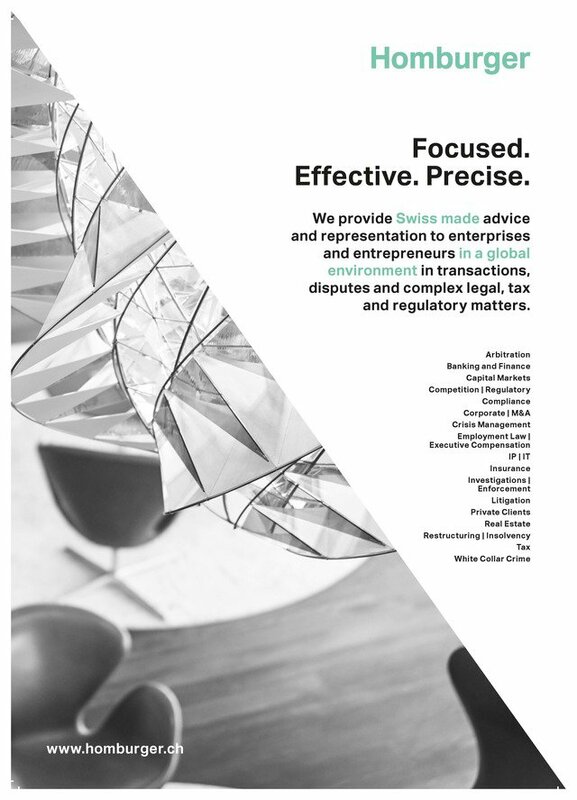 Homburger is a full service Swiss business law firm. Since 1957, Homburger advises and represents companies, entrepreneurs, boards and executives in transactions as well as in complex cases, both domestically and globally. The firm is top-ranked in all major areas of business law and has worked with clients from all around the world. Homburger's international litigation and arbitration teams consist of more than 40 specialists in international dispute resolution. The arbitration team has extensive experience representing clients in the field of international commercial and investment arbitration and other forms of alternative dispute resolution. Our lawyers hold degrees and have experience in multiple jurisdictions and bring a wealth of know-how, practical experience and language skills with them, allowing Homburger to offer first rate, comprehensive and pragmatic legal advice from the moment a dispute arises to its final resolution. We represent clients in in commercial arbitration proceedings, whether ad hoc or under institutional rules (DIS, ICC, LCIA, NAI, Swiss Rules, UNCITRAL, VIAC etc.) and in investment arbitration proceedings (e.g. administered under the ICSID-Rules, Energy Charter or under various regional treaties). We also regularly represent clients in parallel or related Swiss state court proceedings, including interim relief, enforcement and challenge proceedings, or related criminal proceedings. In addition to advising and representing clients in arbitration and other ADR proceedings, several members of Homburger's arbitration team act also as arbitrators and|or mediators in such proceedings or appear before arbitral tribunals as legal experts.